Dinghy with Oars (Motor extra)No matter which Houseboat you choose, the on board facilities include, a comfortable lounge area containing a colour TV with DVD Player, fully functional kitchen, with all crockery, cutlery, large gas fridge/freezer, ice chest, four burner upright gas stove with oven & griller, marine toilet with holding tanks and treated discharge system, full size shower and gas hot water.In addition, an outdoor setting compliments your upper deck, BBQ’s on each vessel with eskys to add to the relaxation you will experience while on your Fantaseas Houseboat Holiday. 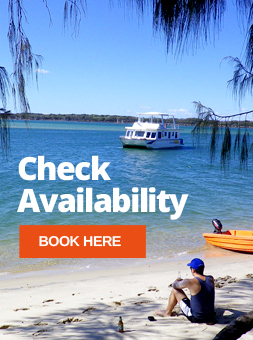 The Spas are located on the top deck of each Spa Boats plus these vessels also have 240 volt power with generators on board the vessel.All you need to bring is your food, drinks, beach towels, personal items and toiletries. On booking you will receive a list of what is on board the vessel you have hired to assist with your packing. We do have fishing rods available for purchasing from our Marina office. We also stock bait if this is required and ice (both 5kg block and 5kg crush). No. You do require a full driver’s license and proof on arrival. FUEL AND WATER ON THE HOUSEBOATS? All fuel and water is provided on the vessel on collection, you will not be required to re-fuel as this is done on return of vessel. The fuel is currently $28 per running hour for ALL vessels, except the Spa range or Majestic Lady. All vessels have a fuel meter on board for you to do as little or as much travel as you wish. Vessels with generators are chrged at $6 per running hour. Tippler’s Cafe has re-opened again and there is also a kiosk where they supply bread, milk and ice if required. You can also access areas with your tender to go ashore. All maps are provided on each vessel and are marked accordingly where there are shops and restaurants. CAN I BRING MY OWN TINNIE, WHERE DO I LAUNCH THIS? Yes you can. At our new destination we have a boat ramp located directly next to all of the fleet, just let one of the girls in the office know and we will unlock the gate to launch. Unfortunately while you are traveling on our houseboats you are in a Marine National Park we also need to adhere to health and safety regulations.